Providing safe, clean, and well-maintained affordable housing options and supportive resident services are essential to the vision of any inclusive, thriving community. But how does that work in a neighborhood like Over-the-Rhine? Did you know many of the architecturally significant buildings in Over-the-Rhine provide affordable housing? Come learn the stories of these historic buildings and the residents who live in them. 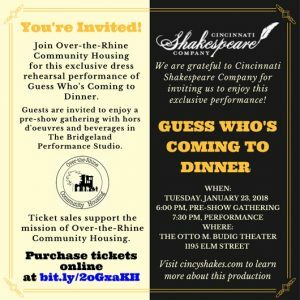 Join Over-the-Rhine Community Housing (OTRCH) for a tour of these properties, meet Over-the-Rhine neighbors, new and old, and learn why affordable housing is an important part of our diverse community. The tour concludes with a reception at the historic home of Mark Manley, M.D., and Annette Januzzi Wick, OTR neighbors and affordable housing advocates. OTRCH staff will be hand to answer questions and offer more information on inclusive housing solutions in our city. Light refreshments will be provided. The event is free of charge but we’re asking guests to register (click here) since there are a limited number of slots. We’d love to see you there! Click here to join the Facebook event page and share it with your friends! Recovery Hotel provides 20 units of permanent supportive housing for homeless men and women in recovery from substance abuse. Counseling and support staff are located on-site and Narcotics Anonymous meets in the lobby on a daily basis. Since opening in 1996, Recovery Hotel has served 255 individuals with a successful program completion rate of 83%. Now in its 20th year, the success of this innovative housing program demonstrates how housing, compassion, and support can transform the lives of individuals in recovery. Please join us at Recovery Hotel (1225 Vine Street) on May 6th from 2-5 pm as we celebrate this incredible journey. We’ll hear from residents about their time at Recovery Hotel, including Donald Whitehead, one of the country’s foremost experts on homelessness. A former resident of Recovery Hotel, Donald is now the Manager of Outreach and Case Management at Healthcare Center for the Homeless in Orlando. The event is sponsored by US Bank, and food has been generously donated by Eli’s BBQ and Bakersfield. Beasley Place is impactful to the neighborhood because it is critical in helping to fight gentrification and is proof that high-income and affordable housing can co-exist and that the diversity in their coexistence improves the neighborhood rather than degrading it. Special thanks to our partners First Financial Bank, City of Cincinnati, Ohio Housing Finance Agency, Miami University, Robert H. Reakirt Foundation of PNC, HGC Construction, 3CDC and CR Architects! Today representatives from The Colony, Over-the-Rhine Community Housing and the Greater Cincinnati Homeless Coalition met to discuss the threat to both individuals and the larger movement for affordable housing and an end to homelessness. Even prior to enduring this current public battle over the right of people experiencing homelessness to take rest outside, campers have been partnered with organizations including Greater Cincinnati Behavioral Health Street Outreach, Lighthouse Youth Services Outreach, Shelterhouse, Strategies to End Homelessness, Over-the-Rhine Community Housing and other organizations to access the limited resources available to obtain housing. The wait to obtain housing often takes a long time. The affordable housing crisis and homelessness are a growing systemic problem because of a shortfall of more than 40,000 affordable homes. We will continue our collective efforts to use these limited resources to try to find housing for people residing in The Colony. We know that there are at least 675 people in shelter looking for housing and thousands more people bouncing from couches to cars to hotels, parking lots and abandoned buildings. Housing is the answer to homelessness. It is a public issue. There must be a compassionate public response to the problem of homelessness. Public policy responses must include: a local affordable housing trust fund, inclusionary housing policy, protections for people who rent from unjust evictions and an end to the criminalization of homelessness. We have decided that The Colony will leave 13th and Republic on Monday, August 20th. People who have lost their homes and live outside, in spite of being chased by the City and County and not knowing where to go, have decided to respond with courage and compassion and chose to leave this site in order to not jeopardize our collective affordable housing movement. 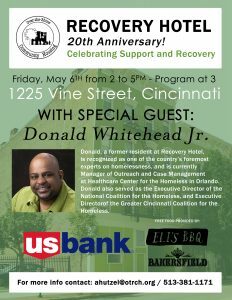 Cincinnati, Ohio (April 28, 2016) – On Friday, May 6, 2016, local nonprofit Over-the-Rhine Community Housing will celebrate the 20th anniversary of Recovery Hotel, which provides permanent supportive housing for homeless men and women in recovery from substance abuse. Sponsored by U.S. Bank, the event will take place from 2-5 pm in the Recovery Hotel parking lot located at 1225 Vine Street in Over-the-Rhine. Food has been donated by Bakersfield and Eli’s BBQ. Over-the-Rhine Community Housing serves as owner, manager, and service provider for Recovery Hotel. Rent for all 20 efficiency units is subsidized through the Department of Housing and Urban Development’s Shelter Plus Care Program, which is administered through a contract with Strategies to End Homelessness. Skilled case management services as well as daily, on-site Narcotics Anonymous meetings provide residents the support needed to maintain their housing, secure income, and rebuild their lives. Many former residents move on to successful careers and continue to give back to the community by supporting others who engage in the journey of recovery. Since opening in 1996, the program has served 255 individuals with a successful completion rate of 83%. Now in its 20th year, the success of this innovative housing program demonstrates how housing, compassion, and support can transform the lives of individuals in recovery. Founded in 1978, the mission of Over-the-Rhine Community Housing is to build and sustain a diverse neighborhood that values and benefits low-income residents. They focus on developing and managing resident-centered, affordable housing in an effort to promote an inclusive community. About Over-the-Rhine Community Housing: Over-the-Rhine Community Housing (OTRCH) is a non-profit community development organization that provides a wide spectrum of affordable and supportive housing options with life-changing programs that help low-income residents in Over-the-Rhine succeed. To meet its mission, OTRCH has restored 123 properties (420 housing units) and assembled 20+ service providers/agency partners to ensure that residents receive affordable housing along with access to health care, job services, education, faith-based services and community associations that strengthen their ability to succeed. OTRCH is located at 114 West 14th Street in Over-the-Rhine. To learn more about OTRCH, visit www.otrch.org.